Happy Hauntings at Dutch Wonderland is a fun, fall family event featuring themed rides, special entertainment, tasty treats, and the Trick-or-Treat Trail: a safe, interactive trick-or-treating experience included in your admission. Three weekends of spook-tacular fun (Saturdays and Sundays, October 14-29)! 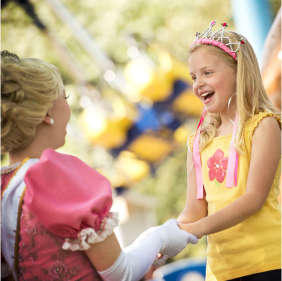 Royalty admission is valid for ages 3+. Ages 2 and under are FREE. Happy Hauntings Admission Ticket includes unlimited rides & entertainment. Adults and children are welcome to wear their Halloween costumes to Happy Hauntings at Dutch Wonderland! We ask all guests in costume to keep the family-friendly nature of the event in mind when choosing to wear their costumes to the park. Guests 13 and older are not permitted to wear masks to the Park during Happy Hauntings, and we also ask that they refrain from wearing costumes that are frightening, gory or inappropriate in nature for a family amusement park. Dutch Wonderland reserves the right to ask a guest to remove any costume deemed inappropriate for our park. Also, costumes or portions of costumes may need to be removed on some rides for safety reasons.